Those of you who have followed this blog from the start may still remember that it begun as a diary of our honeymoon in Southeast Asia. Instead of traditional wedding gifts, hubby and I had wished for donations to our honeymoon fund and we decided that sharing our travel adventures might be nice way of saying thanks. Writing and posting photos as we traveled was a lot of fun but there is one part of our trip that never made it to the blog: Singapore. As the saying goes, it is better late than never, and our visit to this multicultural city state was definitely one of the highlights of the honeymoon trip. Let me offer you a brief escape from the windy, rainy, and chilly March weather (well, at least here in North Germany) with warm memories of a Singaporean summer. We arrived at our fancy four star hotel feeling tired and sticky from having spent the better part of the day cramped in public transportation – first a ferry that almost broke down on the way to mainland, followed by several hours in a crowded bus. We were also a bit under-dressed and still covered in sand from the lovely days of living literally on the beach. Unsurprisingly, a shower was at the very top of our list of priorities. Speaking of which, have you ever seen such a design for a hotel shower? We certainly had not. It made us briefly wonder: is this what our honeymoon upgrade meant? We had some time before meeting up with Daniel’s Singaporean aunt for a dinner at the famous Marina Bay Sands hotel so we grabbed a cab to Singapore Flyer – one of world’s tallest Ferris wheels. By the time we got there the sun had already set and we were treated to gorgeous nighttime views of the city. 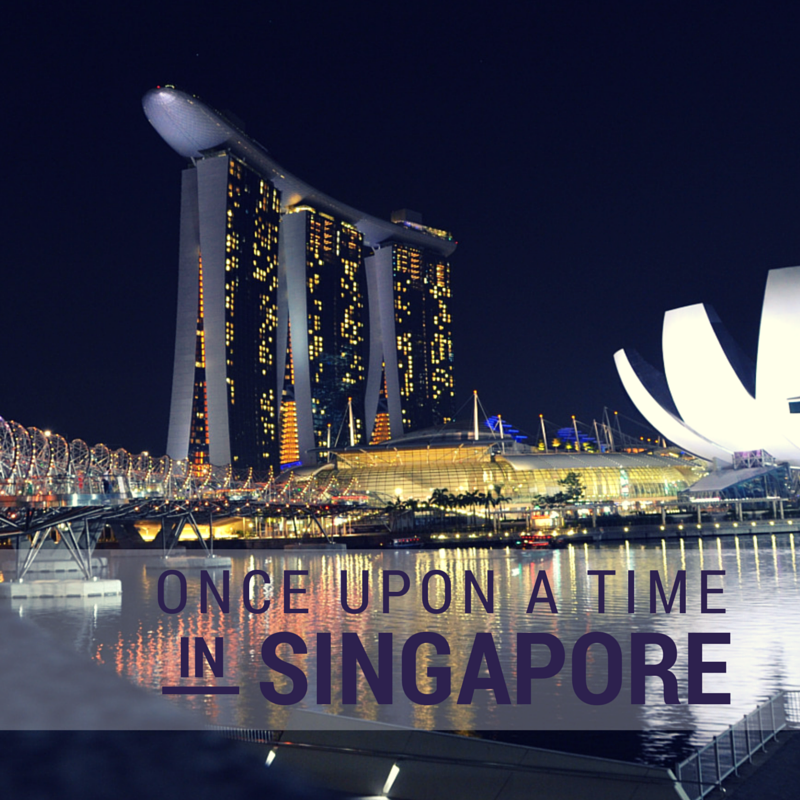 My memories of the London Eye Ferris wheel paled in comparison with the breathtaking views of the Singapore skyline. On the short walk from the Singapore Flyer to the Marina Sands shopping mall we enjoyed some more splendid sights of the buildings around the marina. We were not allowed to take photos inside the gigantic casino area that spanned four levels but I can assure you that the food was great and that we lost all the money that we had allotted for trying out slot machines. On the agenda for the morning of our second day in Singapore was shopping. I am not a good shopper on the best of days so a few hours in the Orchard Road area were more than enough. After a refreshing dip in the hotel pool we were off again, this time for a walk to (and in) the Chinatown. The dusk was setting and we were again treated to beautiful sights. We strolled around looking into some of the small shops for souvenirs and making feeble attempts at haggling. Of course, the Chinatown would be incomplete without rows and rows of food stalls. However, we did not stop at any of them. After over a week of only Asian food I was craving something more Western. So we headed back to the Clarke Quay area where our hotel was located and found ourselves a nice riverside restaurant. In case you are wondering: those beautifully lit “umbrellas” above the streets provide air conditioning. After dinner we crossed to the other side of the river and sat down by a bar that good live music. Of course, I could not pass on the special offer of Singapore Sling cocktails! On our third and final day in Singapore we headed to Sentosa – an island resort packed with various attractions. Our first target was the S.E.A. Aquarium – I had dreamed for years to visit one of those underwater tunnels where you can observe sea-life all around you and where better to do that than at the world’s largest oceanarium! The aquarium teemed with unique sea creatures. And I decided that rays are much cooler than sharks. Well, to be fair, that may have had to do with the fact that the sharks were freshly fed and were just lying around doing nothing. After seeing more sea creatures than I had probably seen in my entire life counted together, it was time to set off and see what else the Sentosa island had to offer. Beautiful as it was, Sentosa felt a little too clean and a little to staged. Behind our very posed camera-timer-selfie you can see the spotless beach where each rock serves decorative purposes and each palm is planted in its most photogenic angle. After trying out some other attractions like a 4D cinema and a virtual roller-coaster it was time to head back to the hotel. It was our last night in Singapore and we had family dinner and drinks appointments to keep. To make it more interesting, we chose the scenic way back: a cable railway! I have enjoyed the beautiful architecture of Paris, I have savored the hustle and bustle of London, and walking the streets of New York made me feel like I have just stepped into a movie. Singapore I fell head over heels in love with. Several times during our short stay I caught myself thinking that I would not mind living here for a few years. And this is completely untypical for me as I usually prefer my daydream hometowns small, cute, and historical – like Strasbourg, France or Salzburg, Austria. Singapore could not be more different yet I am looking forward to meeting her again. P.S. Click here for more honeymoon adventures. Ps. I had never heard of ac umbrellas, will definitely look in to them!